I got to play stay-at-home mom today and boy, am I wiped out. I’m not sure what was different about today than some weekends when I have the boys solo, but it was exhausting! I think some days the kids decide they want to be amicable and sweet. And then there are some days that they strategize about how to push every one of your buttons. Today would be the latter. Sometimes kids can just wear you down and knock you off your game. Today would be that day too. Apparently I was a little loose with my language, because when Blake got home Brogan told him, “Look Daddy, I got all of your crap out of the shed!” Blake and I looked at each other and chuckled a bit. But then it continued. “Look at all this crap!” [said in a really happy and excited tone] Blake and I started exchanging slightly more serious looks. Blake thought on his feet and said, “Buddy, mommy made that word up, it’s all just stuff.” That sufficed, and the word crap was not mentioned the rest of the night. I’m sure he’s just saving it for school or the pediatrician’s office, though. No surprise here, but Beckett was a screamer today. The kid loves his swing outside, but it is impossible to swing him constantly. So if I wasn’t swinging him, or walking with him out to be swung, he was pissed. I could sidetrack him occasionally with a broom or a random tool, but it always went back to the swing. 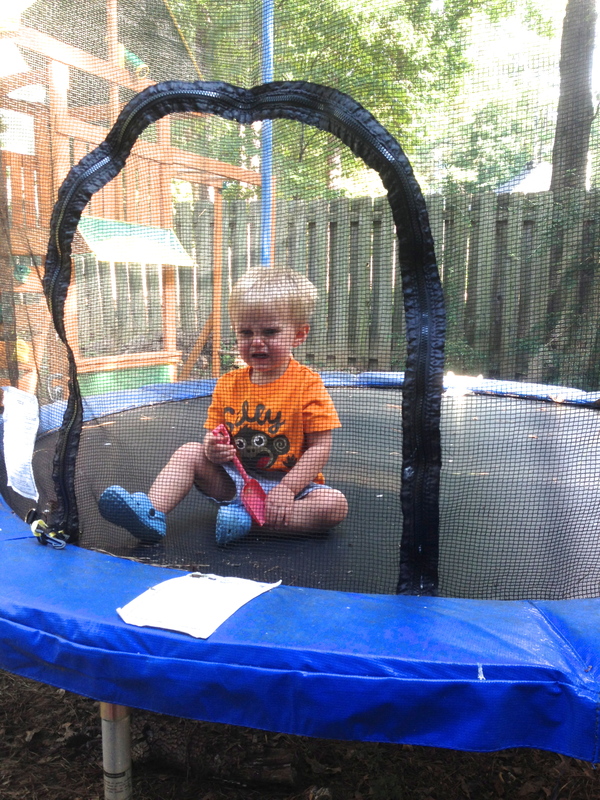 I even tried using the trampoline as a playpen, and that went over well! I swindled my neighbor into entertaining the screamer so I could finish dinner (she thought she was just returning a sewing machine!). Little did she know she was entering kiddy hell. Being much more on top of things than I after the punishing day, she immediately noticed the boys were playing with a very sharp paddle bit. Great, that would have gone real nicely I somebody’s neck. 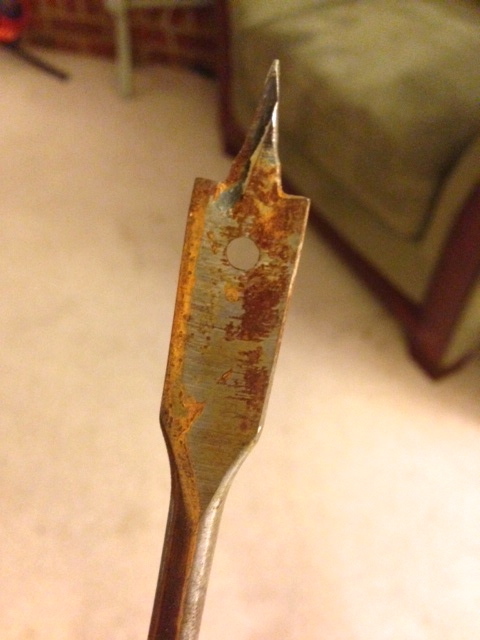 And it was rusty, even better! Thank you, Chantelle for the 15 minutes! And at 7:22pm, the hubs came home form work, hallelujah. 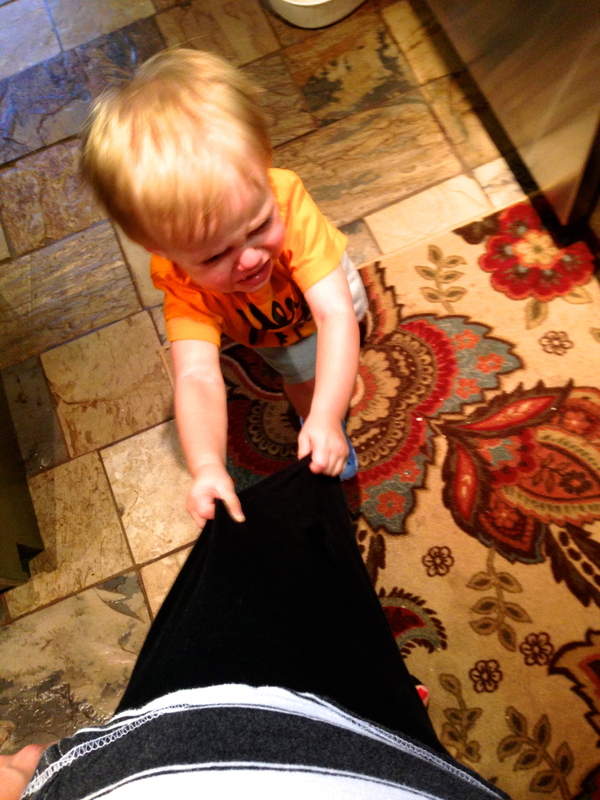 I think I’ve made previous remarks about my reverence for stay-at-home moms – reaffirmed. You guys do have the hardest job in the world. I will be going back to work tomorrow, to my quiet and peaceful office where I will get to interact with humans who are guided by logic, with whom you can have a reasonable conversation and who do not use screaming as a primary method of communication. Yes, I will miss the sweet boys that my boys are on days other than today. And I hope it is those sweet little boys who I am greeted by when I walk in at 4:40 tomorrow afternoon. But for now, goodnight, I’m freaking exhausted. This entry was posted in Kids and tagged Hard work, Housewife, Kids, Parent, Parenting, Staying at Home, Wiped out, Working mom by biscuitsncrazy. Bookmark the permalink. Even the good ones can push the right buttons.